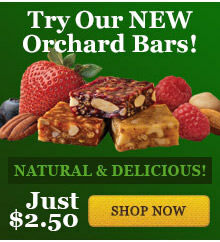 Succulent treats, ripe for giving! Our premium Glacéed Apricots start out as fresh, sun-warmed fruit, picked at the height of juicy perfection. Each tangy apricot is then dried just enough to gently preserve and intensify the natural flavor; then simmered in a cane sugar nectar to plump the fruit and add a remarkably soft, tender sweetness. 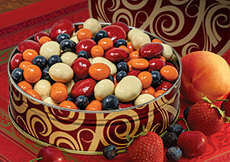 Choose from gift boxes or gift tins. 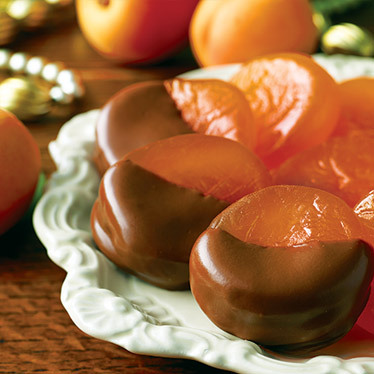 Also available are our Chocolate-Dipped Glacéed Apricots, where we hand-dip our succulent delicacies in a rich chocolate blend. INGREDIENTS: Glacéed Apricots: Apricots, sucrose, glucose, potassium metabisulfite (a preservative), citric acid. These products should be enjoyed right away, but may be stored at room temperature for one week or refrigerated for up to four weeks. Tightly seal with plastic wrap after opening. So So yummy! 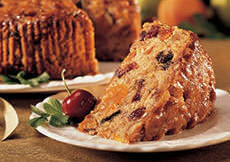 Very generous with the delicious chocolate and the apricots are so plump and moist and feast for the taste buds! These little gems are better than candy. .Our whole family loves them. if you've never had juicy dried apricots before, be prepared to be amazed - these plump little goodies are so tender and sweet. The dipped ones are really marvelous with that little bit of crunch. One year i forgot to order these for my mother for Christmas and she missed them so much, i finally got the hint and she got them by New Year's. These are so good. The apricots are really plump and sweet. Don't ruin them by getting them with chocolate, unless you really NEED to! !